This entry was posted on Sunday, October 26th, 2008 at 8:19 pm and is filed under Live 08, Maxwell. You can follow any responses to this entry through the RSS 2.0 feed. You can skip to the end and leave a response. Pinging is currently not allowed. I was at the concert in Denver. Loved it, it was wonderfull. I saw you last time you were in Denver at the Fillmore, both concerts were great. You are soooooooo beautiful. Cant wait to see you again. Look forward to your new CD. 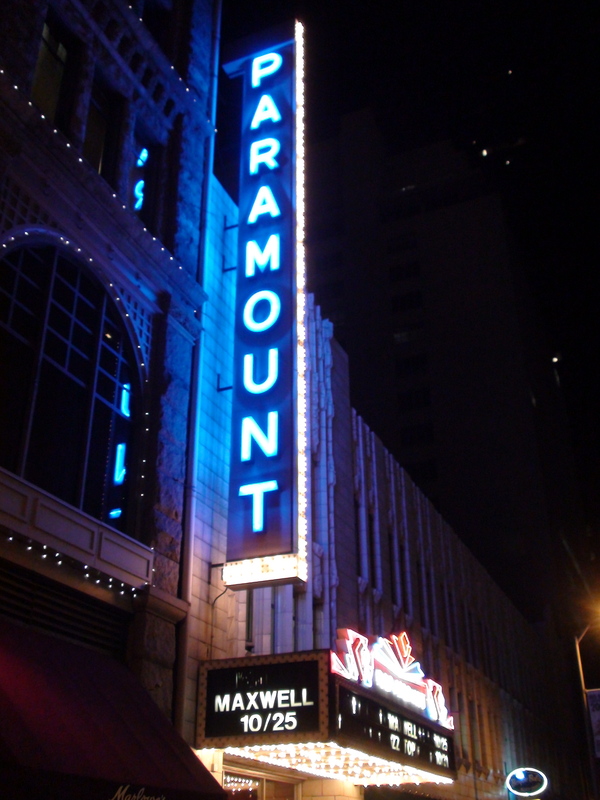 Mr. Maxwell you indeed were the highest of the high Saturday night @ The Paramount here in Denver, CO.
What a most amazing, magical and unforgetable evening. My mother and I sat front row center stage and you brought the fire babe!! Thank you so much for the incredible hug and kiss (you wore my lipstick on your cheek for a long while!). My mother was in awe and she thanks you for the love as well. P.S. You know that part of the show when you were expecting the ladies to throw their chones on stage? Well I’m a lil’ old fashioned so I couldn’t get with that, however I did throw you my black satin nightcap LOL!! Sweetheart if you could have seen your facial expression when you opened it up…..classic!! Best wishes for the duration of your tour and beyond love, and I can’t wait to see you back in “The Mile High City” soon. It feels good to see your name up in lights huh?! WE are so blessed to have you back. Good music has gone out of the door. Thanks for SHARING YOU, with US! OMG….we were there…Maxwell is amazing! Loved the show, come back soon! Seeing you has been the highlight of this year. You were amazing. I was smiling the whole time. My cheeks were killing me by the end of the night. I’m so happy you came to Denver. Please come back SOON! You have a lot of fans that adore you. Can’t wait for your cd to come out. I went to the Concert with a girlfriend of mine who says your “are my baby” and has your picture as her background on her computer at work! You put on an amazing show and I am so glad that I decided to go. After you sang Till The Cops Come Knockin and left the stage, she said well, I guess it’s over. I looked at her and said It cant’ be over, he hasn’t sang Ascention yet!!! And then you came back out and allowed US to sing it to YOU!! It was wonderful!! I am not a person that is easily impressed, but I must say you put on quite a show. You have gained a new fan and I wish you all the best in your ventures. Hope to see you back in Denver again soon. Thank you for a wonderful night out!! Like the others I was at this show also. I was in the left first row. You really put on a GREAT performance! A week later I am still in AWE. ;o) Am glad that you made a stop in Denver. Keep doing what you do, we LUV it! I am looking forward to the new albums, and another go round of concerts!